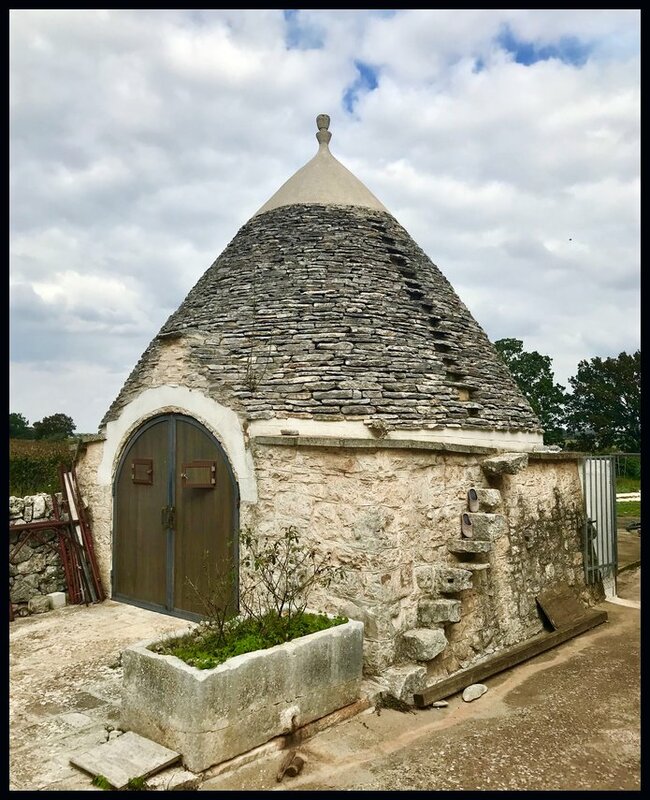 A Truilli dry stone hut with the conical roof typical of this historic building scattered throughout the Itria Valley outside Bari in Puglia. This one is at the Fatalone Winery. It’s winter and cold outside in many areas of the northern hemisphere. The times I like cozying up near a fireplace to feel the heat penetrate my skin. That satiating yum you get not because of food but because of warmth. As we don’t have a fireplace a glass of wine will do just fine. Make it Italian please. And make it red. Last October it was all Italian wine in Puglia with Radici del Sud. We parked at an uppermost point in Gioia del Colli just 40 minutes from Bari. Pasquale Petrera greeted us at his laid back winery Fatalone where eight hectares of Primitivo thrive on limestone and clay soil. At 400 meters (1,300 feet) they’re almost the highest of 15 wineries in the small DOC. Primitivo production is barely 60,000 cases. Pasquale’s family was the first to bottle wine here in the relatively young DOC: 1987. …is not your typical Primitivo. In California it’s often lush, jammy, and full. Understandable given the warmer weather. It also gets quite warm in Manduria and Salento at the bottom of the Puglia heal. Primitivo in this area is again full, rich and lush. I do enjoy both and they can definitely warm your soul. But the slightly cooler Gioia del Colli area produces Primitivo like no other with almost indescribable freshness and depth. Primitivo is thin skinned and can over ripen quickly. Yet it can ripen unevenly too. 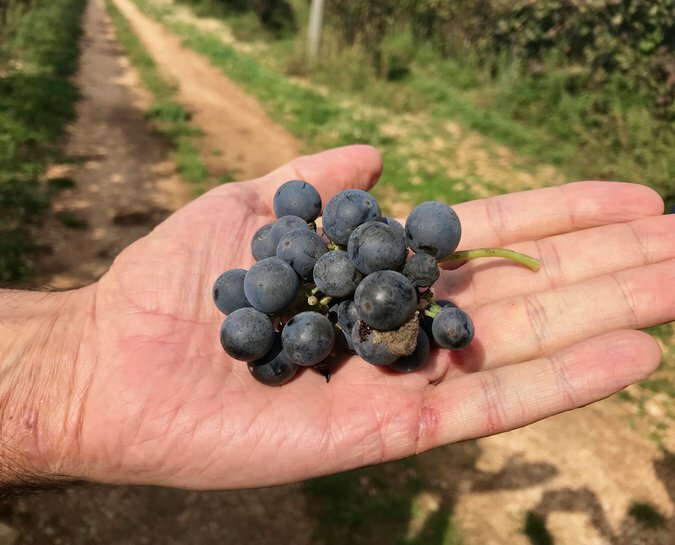 Pasquale prefers to preserve acidity, hand harvesting at what he says is “…the right time to render the most authentic expression of the grape”. For him this is slightly under ripe. For detailed information about the Primitivo grape scroll to the bottom to access links. Continuing this discussion he walked us through a vineyard pointing out racemi, a term new to everyone in our group. It’s a secondary small crop of very small berries that develop a month after harvest. The racemi is picked in October. Interesting to note this second harvest is rarely used in winemaking, with the exception of Puglia. It gives a lighter, more acidic wine with intense aromatic elegance. Pasquale uses it for rosato. After our vineyard walk Pasquale explained he’s the fifth generation of family to produce wine at Fatalone (Azienda Agricola Petrera Pasquale). His great grandpa wanted a harmonic relationship with the vines thus chose to farm without pesticides or herbicides from day one. 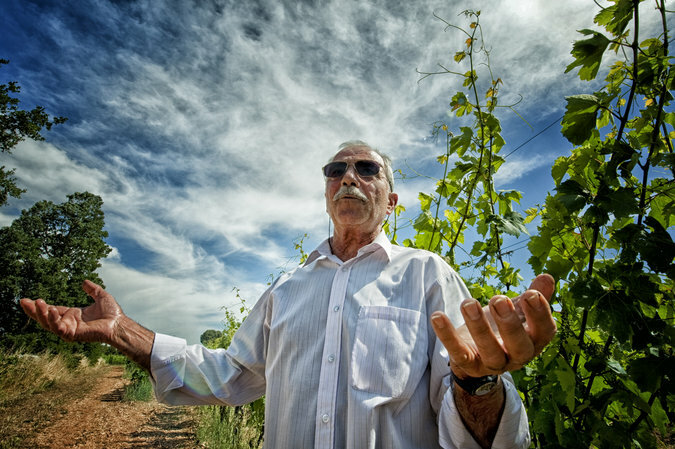 Pasquale’s grandfather walked in the vineyards and talked to the vines. He’s captured in action here! Continuing in both these veins Pasquale’s question was “What can we bring to the fruit now?” His initial answer was harmony and peace. Then he learned of music therapy and biodynamics and decided to apply them. The operation is 100% organic (utilizing some biodynamic techniques) with 100% of energy from solar panels resulting in zero CO2 emissions. Passing through the barrel room we paused, each thinking it a curious place to hear the music of rainfall, birds, and streams. Another new concept: micro vibrations of music improve the exchange of oxygen in wine. Although there is no scientific evidence to support this, Petrera shared each vintage and barrel react differently as a result and wine in those without music didn’t have the depth of complexity. I note he has a strong physics background! 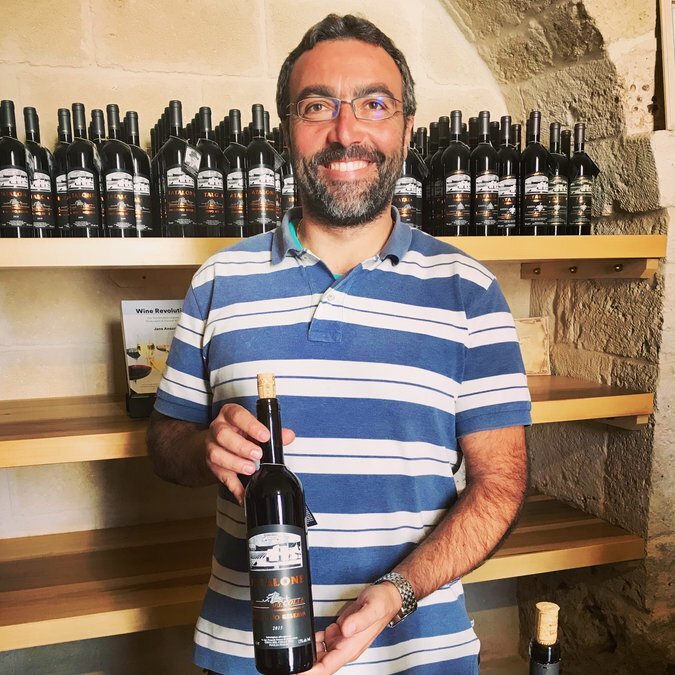 Oenologist Giovanni Aiello is located in Castellana Grotti in Puglia not far from Bari. Also producing Primitivo (just 2.5 hectares in Gioia del Colli) but again a different style from Manduria- he strives for fresh, energetic wines that show “the style of the area in the glass of wine”. Whole bunch fermentation is completed as part of this goal resulting in a more complex bouquet and deeper flavored wines. Like Fatalone, no filtration and minimal sulfur dioxide use is standard. Giovanni considers himself an artisanal producer from vineyard to bottle- a person involved in all production steps yet with minimal intervention. This flows to his labels too. He developed a label stamp indicative of chakra (energy). For his Primitivo, called Chakra Rosso, he uses red. Red is the first Chakra color and relates to roots and connection of people to the soil. During this time when cold and rainy days are common in Bordeaux I prefer sipping red wine and eating warm food. And I will reach for these beautiful Primitivo from these two Gioia di Colli producers. They go beyond fruitiness; they are wines for discussion and savoring. These wines were tasted as part of the Radici de Sud “Territories and Terroir di Puglia” press trip. It included not only wine but the foods and cultural aspects around the areas of Bari, Gioia del Colli and the Itria Valley. GrapevineAdventures has a nice overview of all areas visited. Berries galore! High intensity aromatics of black slightly under ripe berries, cherries, and plums are concentrated but not sweet; mixed berries and cocoa powder grace the bright acid, medium bodied palate; fine tacky tannins; faint forest spice on the finish. This wine aged three-months in stainless tanks with a small amount in used barrels. Less berry than the Classic but more overall depth of flavors with balsamic notes, carob, and clove that follow to the very fresh palate; balanced structurally with dusty-fine tannins. The winemaking difference? 24-36 hours of whole berry maceration and one year in used oak of varying ages (they keep their barrels on average 15 years). Note this vintage has some new oak as they changed cooperage. Giovanni produces just 6,500 bottles of his Chakra Rosso. On the left you see the stamp he uses to create his labels. Aromas and flavors of ripe cherry and plum, licorice and cinnamon hints. The fruit is lasting and bright on the palate, the wine substantial with tacky yet soft tannins. Still a baby but delicious now. This month the Italian Food, Wine, and Travel group help you find Italian wines and food for cold winter nights. Our host Camilla at Culinary Adventures With Camilla shares a preview here. You can check out the food and wines from other group members below. And we’ll be on Twitter January 5th for a chat at 11am ET with hashtag #ItalianFWT- join us if you’d like! Martin at ENOFYLZ Wine Blog shares A Surf and Turf Feast with Donnachiara Wines. Katarina of Grapevine Adventures encourages us to Get Cozy By The Fire With Italian Wine. For more information about Primitivo (and Zinfandel, which are the same but adapt differently to different areas) I refer you to Nancy’s article on Pull That Cork and The Wine Institute. For another take on Puglian Primitivo enjoy SnarkyWine. What a great post! Thanks for sharing. You’re right about the California Primitivos. Usually pretty jammy which is not typically my favorite. I will try to get my hands on some of Pasquale’s wines. Thanks for joining me this month. Thanks for stopping by Camilla! I’ll try to find out where in the US Fatalone wines are distributed and let you know. Both of these sound like Primitivo, I need to try! Thanks for sharing Lynn! I’d love to see if what Pasquale feels about the music improving the oxygen in the wine if there is some truth behind that ; ) I love the thought and passion though. You should feel free to send a message to Pasquale about it, he speaks fluent English and I’ll bet would welcome the conversation! Yes to both of them, and in particular I have a new appreciation of Primitivo! I am enchanted. I just finished Day 5 of my 30 day yoga journey and it was about flow. Then to sit and read this makes it feel like the universe is all coming together. I love the photo of his grandfather! He looks like a earth guru! The music in the cellar…(I once saw a fascinating movie called “What the bleep do we know?” and positive vibrations do make a difference I think). and the labels….I am enchanted. I’m going to have to seek out some Primitivo. Thanks for sharing. I hope you are able to find one of these two Primitivos Wendy! I’m intrigued by the sound of this cooler weather Primitivo. And that is very interesting about the music potentially enhancing the wine! Kind of like a cool climate Syrah, Gioia del Colli Primitivo are lovely and bright. Maybe that will be the next place you go on a press trip David?!? The Racemi is very interesting! I’d love to learn more about that! It caught us all off guard… racem..what?!? Surprising that apparently this is the only area utilizing it. Thanks for sharing your visit! So many great wine adventures you have had!!! I have not tried many Primitivo wines, but look forward to checking out the three you highlighted. Also love the music and yoga connections. Hope you can find these Jane. Be fun to feature Gioia del Colle primitivo in the future.